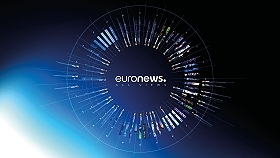 Globecast delivers Euronews content over public Internet. IBC, Amsterdam, stand no. 1.A29, September 2017: Globecast has announced that it's expanded its relationship with Euronews, the most-watched international news channel in Europe, to deliver broadcast-grade video content over the public Internet for Euronews’ eight new tailor-made channels among its 12 linguistic services. Globecast is doing so via its robust and innovative GCXN transport service, which manages the transport of broadcast and media services over the public Internet — lowering costs and increasing flexibility. Under this deal, Globecast is supplying an end-to-end transport solution using its bespoke GCBN (fibre) connectivity from Euronews’ media facility in Lyon (France) to Globecast’s facility in Paris. From there, the channels are delivered via the GCXN service to operators worldwide and are broadcast over satellite, cable, and IPTV to consumers across varying regions. The content is delivered to around 60 affiliates and the eight channels are available in: English, French, Italian, German, Turkish, Portuguese, Russian, and Spanish. They were created as part of Euronews’ NEXT strategic program to empower its multi-cultural audience. Globecast’s GXCN transport service lets customers create and distribute content wherever they may be, faster and more cost effectively than using traditional fibre or satellite. For the utmost reliability, a synchronous transmission is used for the exchanging of real-time video content. It optimises buffering in order to retrieve only the missing packets. GCXN comes as a standalone service or as a complementary solution to satellite services. It can also be used for disaster recovery and monitoring of video services.